This internship has been a really incredible learning experience so far. There are so many different elements of the job that employ a variety of skill sets. As I mentioned in a previous post, one skill that I have worked on significantly is critical thinking. The ability to think critically is one of the main pillars of the Brandeis experience, and I am continuing to realize its importance in the “real world.” Thinking critically does not mean challenging every single idea that you come across. Rather, it means understanding all of the perspectives of a situation and gaining as much background information as possible to support a claim. The research I have been conducting is not only tedious, but very politically charged, and it is easy to fall into the polarizing loop of the Israeli-Palestinian conflict. In an era of so-called “fake news” and “alternative facts,” it is important to not take articles, news headlines, and other media sources at face value. I am a firm believer in the power of “soft skills.” Of course my internship requires me to utilize hard skills such as data analysis and programming; however, my internship really focuses on the acquisition and implementation of vital soft skills. One significant skill I am working on is communication. Communication is a fundamental aspect of both the workplace and life. I have had previous experience in other workplace settings, as far as working with management, supervisors, and coworkers. This summer, however, I have learned about forms of mass communication, such as email and social media. Different forms of communication have distinctive strategies that need to be employed, which has been somewhat difficult to navigate at times, but has definitely strengthened my skills overall. For a firm focused on conflict resolution, we still have our own conflicts that can arise. I have definitely learned the importance of transparent communication as a tool for conflict resolution. From what I’ve witnessed, many of the problems that arise in the workplace setting stem from minor miscommunications. One of the facets of this internship is working closely with both projects and the other interns. Teamwork and team-building skills are extremely valuable to the work world, and I have gotten an incredible amount of experience with this over the summer. I wouldn’t say this is my first time learning about these skills, but I have been able to perfect and practice soft skills that will be relevant to my future at Brandeis and in my career. This summer has taught me a surprising amount about myself. Since there is a wide variety of tasks in the office that the interns work collaboratively on, I have found that I emerge as a team leader more often than not. While taking initiative is not necessarily a bad thing, I have had to learn to release some control and cooperate in a group setting more efficiently. Overall, I would say that I have learned a few new things, but more importantly have employed and practiced my pre-existing skills and ideas. My Brandeis coursework and work/volunteer experience is focused on achievable coexistence through social action and cross-cultural communication. I am involved closely with the Brandeis PAX (Peace, Conflict, and Coexistence Studies) program and other on-campus groups that support these ideals. Nonviolence International is a perfect fit for me, as it seeks to use elements of social action and education to work towards peaceful resolutions. In that sense, almost all of my coursework has relevance to my organization. I have taken some incredible courses at Brandeis, with Professor Fellman and others, that have discussed the importance of compassion, empathy, and humility in the conflict resolution process. On a programmatic level, these lessons have been paramount in my understanding of my organization and its mission. Through the research I am conducting, I am learning an incredible amount of information about the history of Israel/Palestine, and how the current situation is, in part, a reflection of history. My time at Brandeis has been significant in a variety of ways, but most importantly it has taught me two main things that are applicable to my time at Brandeis. First, in every class, for every paper, we as students are always asked to think critically about the subject matter. In context of this internship, critical thinking is SO important! When I sift through news headline or watch videos about the subject of Gaza and the Great March of Return, and in turn reading Facebook posts from my Brandeis friends, there is always a hint of “fake news.” Many media sources focus only on how much trauma and emotion is deeply engrained into this conflict, and publish stories that cause “outrage” or emotional reactions for the reader. While this tactic does get views, clicks, and shares, it also adds fuel to the fire by further polarizing the “sides.” Therefore, I have had to utilize critical thinking when conducting my research. Second, on a more social level, Brandeis has also taught me about the Jewish community and about the cultural and religious symbol that is Israel. With this in mind, I am able to somewhat contextualize details and situations that can be viewed as one-sided. However, I also encourage myself to evaluate accountability. This is such a divisive, complex issue, and there is fault and also victimhood on both sides. Being a Brandeisian allows me to cast a both critical and compassionate eye on the ever-developing situation. 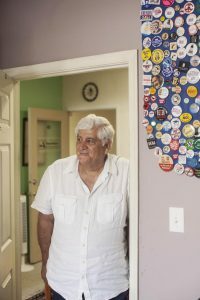 I included a photo of my organization’s founder, Mubarak Awad. He is a Christian Palestinian who is a first-hand participant in nonviolent action and civil disobedience in Israel/Palestine. He is an extraordinary individual, and I learn so much from him every day! Hi everyone! My name is Zosia Busé, and I am a rising junior at Brandeis. This summer, I am working for Nonviolence International (NI), a non-profit organization based in Washington D.C. The D.C. office is considered the headquarters of the organization, but they consider themselves “a decentralized network” so there are small satellite offices all over the world. There is also an office in New York City that works directly with the United Nations on disarmament, as NI is a non-governmental organization in Special Consultative Status with the Economic and Social Council of the United Nations. At its core, Nonviolence International is an organization dedicated to the principles and practices of nonviolence and nonviolent action. What is nonviolence and nonviolent action, you may ask? Check out this link to learn more! NI’s initiatives manifests in a variety of ways. The beauty of NI’s decentralized nature is that NI supports coexistence efforts in conflict-ridden areas all over the world. In the few weeks that I’ve been here, I’ve learned so much about the different aspects of the conflict resolution process, and how principles apply to real life scenarios. NI supports nonviolent action programs in countries such as North/South Korea, Ukraine, Thailand, and Palestine/Israel. On a grand scale, Nonviolence International seeks to address the vast injustices of war and conflict. But as we all know, there are a variety of injustices that occur within the context of war and violence, such as poverty and human rights violations. 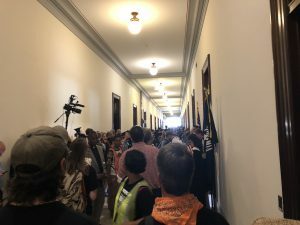 Protesting outside of Senator Mitch McConnell’s office! This summer, I am serving as the lead intern for the Palestinian projects, which I could not be more excited about (especially in light of current events). In this capacity, I have started working on research about the application of nonviolent action and mediation, but I will also be working as a liaison and as programmatic support for nonprofit organizations such as the Holy Land Trust, Center for Jewish Nonviolence, #FreedomFlotilla, and many more. This link will give you an indication of some of the cool stuff I get to work on. (This page will lead you to more links to learn more about all the different groups!) Many of these projects have different tasks that come up daily, mostly related to research, updating social media, editing websites, and administrative assignments. Additionally, NI tries to support any active organizing efforts in D.C. For the interns, that means heading out to protests, teach-ins, demonstrations, or anything that comes up! On my third day on the job, we went to the Russell State Building with Reverend Barber’s Poor People’s Campaign, protesting “The War Economy: Militarism and the Proliferation of Gun Violence.” We ended the rally at Senate Majority Leader Mitch McConnell’s office by dropping white carnations to represent lives lost to violence. I hope that my work in supporting NI’s projects in Palestine will help to create more awareness for the entire situation on both sides, and hopefully work towards humanizing the victims of the violence. I know I won’t solve the conflict from D.C. in a few short months, but I hope my role will work towards the ultimate goal of coexistence between Palestine and Israel. Looking forward to the rest of the summer!